A slow cooker can be a real time saver for busy moms. They’re also great to have around in the summer when it’s too gosh darn hot to cook. 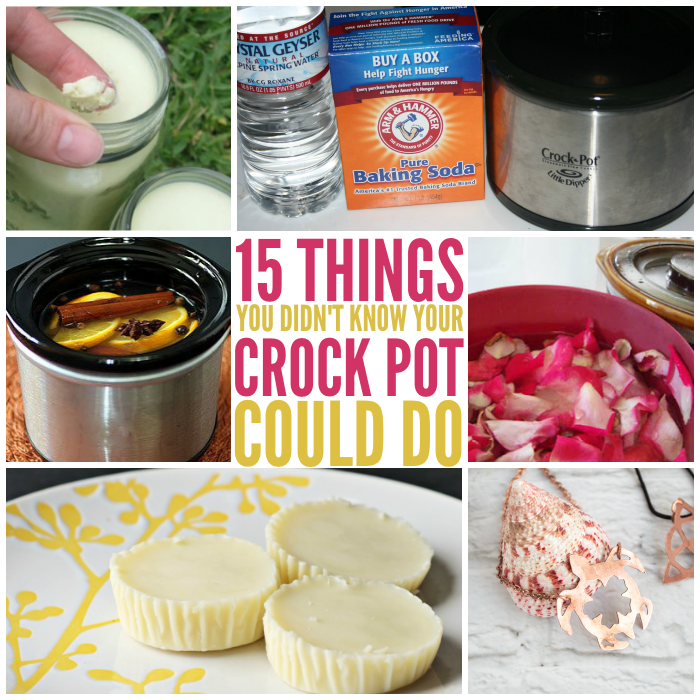 But you can use your crock pot for more than whipping up delicious meals. 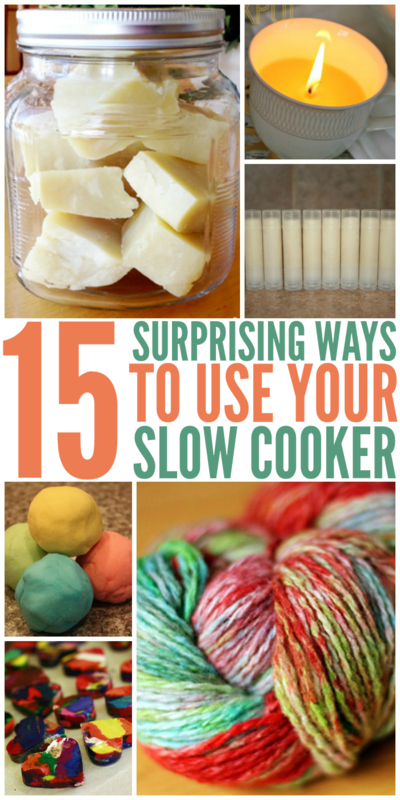 Here are 15 unusual ways to use a slow cooker. Reuse your kids’ old, broken crayons by melting and remolding them using this slow cooker crayon recipe. Knitters and crocheters will appreciate the fact that you can dye yarn in the Crock Pot using powdered Kool-Aid. Did you know that you can make old fashioned bar soap in a slow cooker? If you prefer liquid soap, you can make that in the Crock Pot, too. Whip up some shea butter sunscreen in the slow cooker if you’re looking for a more natural alternative to commercial sunscreen sprays and creams. Here’s another project to do with the kids: crock pot playdough. Reuse your wax melts to make slow cooker candles. Pour into a pretty cup, and they’d make a great gift! Clean your tarnished jewelry in the slow cooker! Check out the homemade jewelry cleaning solution, too! Make a dozen lip balms for pennies using your slow cooker. Neutralize bad odors in your home using just baking soda, water, and your trusty ol’ Crock Pot. Create all-natural air fresheners in the slow cooker using citrus fruits, spices and extracts. Make your own lotion bars in the Crock Pot. There are so many possibilities when you combine different essential oils to scent the bars. 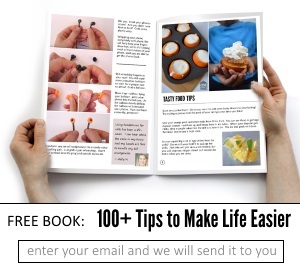 What an easy and useful gift idea! It sounds a little involved, but if you’re so inclined, you can make commercial-grade slime in your slow cooker. Keep moist towels hot in the Crock Pot when you’re doing facials or manicures. Rosewater can be pricey in the stores, but if you have your own roses and a slow cooker, you can make your own in just a couple of hours.